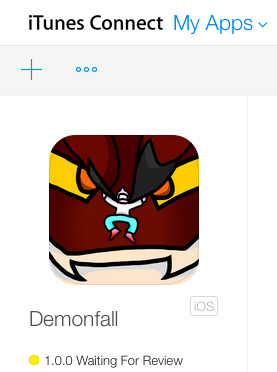 Well, Demonfall got submitted to the iOS store. I’m super relieved this issue got resolved, just so I don’t have to keep worrying about it in the back of my head. Hopefully there shouldn’t be any more problems but basically Demonfall is finished. I will probably do updates/fixes to the game in the future but I’m not sure if I’ll document them yet. Woo congrats!! Great job :D Will check it out sometime.